$1 billion sales in two minutes. More than 250,000 purchases every second. Singles’ Day, China’s annual retailing extravaganza, absolutely crushes Black Friday: E-commerce giant Alibaba raked in $17.8 billion in gross sales during last year’s event, more than double the combined total of $6.8 billion in sales during the United States’ 2016 holiday shopping kick-off. The shopping spree lasts only 24 hours, but its environmental impacts will extend for decades. 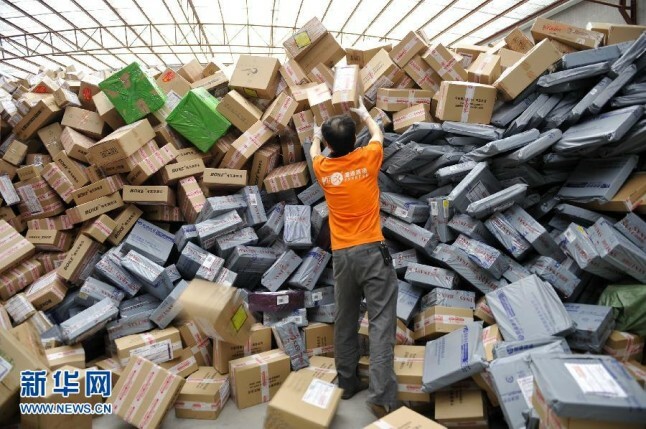 Couriers delivered more than a billion packages after 2016 Singles’ Day sales, and just 10 percent of the packaging was recycled. Packing tape, bubble wrap, and plastic bags contain non-biodegradable materials that take hundreds of years to break down, and cardboard boxes covered with adhesive tape are difficult to recycle. Facing growing environmental pressures, China’s e-commerce businesses are shifting toward an eco-friendly logistic network, introducing tape-free boxes, electronic invoices, and biodegradable packaging. Yet the packaging waste conundrum cannot be resolved without a well-integrated recycling and composting infrastructure. Due to an ineffective sorting process and a primitive recycling system relying on sanitation workers, Chinese cities often direct collected garbage into one municipal solid waste stream, which comprises both recyclables (e.g., plastics and paper) and non-recyclables (e.g., food scraps). Increasing 8-10 percent annually, China’s municipal solid waste totaled 200 million tons in 2016—representing approximately a quarter of the world’s total generated waste—and is predicted to exceed 500 million tons a year by 2025. In addition, there are simply not enough composters in urban areas. In 2010, China only had 11 operating composting plants, but it had 640 sanitary landfills, where nearly two-thirds of municipal solid waste is buried. In comparison, the United States has close to 5,000 composting plants and approximately 50 percent of municipal solid waste is put into landfills. Inside these landfills, biodegradable contents decay in the oxygen-free environment and slowly release methane, a greenhouse gas with 25 times more global warming potential than CO2. Food waste, which is biodegradable, has 15 times the methane production potential of cattle manure. Rather than being released into the atmosphere, this methane could be captured and processed into biogas by digesting discarded food at stand-alone facilities or at innovative new sludge-to-energy plants. Not all landfills in China are sanitary; in Beijing alone, there are more than 1,000 open dumpsites scattered around the city. Without appropriate oversight, these landfills are ticking time bombs, causing groundwater contamination, soil degradation, biodiversity loss, and air pollution, as the garbage gradually rots. In need of better solutions for garbage management, China is looking to Japan and Europe for ideas. Tokyo, one of the world’s largest cities, has diverted all burnable items into incineration plants. At Shinagawa plant, 600 tons of waste go up in flames every day, leaving only 180 tons of bottom ash—a non-combustible residue from the furnace—in landfills. Across Europe, 450 incinerators burned roughly a quarter of its municipal solid waste in 2013, and the released heat was used to convert water into steam to generate electricity. The idea of turning trash to heat or power through combustion, or “waste-to-energy” incineration, has quickly grabbed the attention of the Chinese government. By the end of 2015, 223 waste-to-energy plants burned one-third of municipal solid waste, and more than 100 more are planned. Beijing is pushing to double its incineration capacity, aiming to burn 54 percent of its municipal solid waste by 2020. Under Chinese President Xi Jinping’s plan to build an ecological civilization, the incineration industry is expected to continue its expansion in order to replace stinky, polluting, land-intensive garbage dumps. The rapid growth of incineration stems from Chinese cities’ short-term focus on maximizing the capacity to dispose of waste without going to the trouble of sorting it, says Mao Da, a co-founder of the China Zero Waste Alliance and the Rock Environment and Energy Institute. Most treatment methods depend on thorough classification. For instance, recycling or composting requires Chinese urbanites to voluntarily separate recyclables and organic materials from other trash, and insufficient incentives and penalties have failed to induce this behavior. Waste service companies must invest in equipment to deposit and transport each category of garbage. And municipal governments must revise the waste management framework, engage public and private stakeholders, and initiate policies to sustain improvements throughout the waste disposal chain. By contrast, waste-to-energy incineration seems to be a silver bullet for China’s overwhelming waste issues, ridding cities of mixed garbage mountains with no major policy or behavioral reforms–and producing a renewable energy source as well. These benefits may explain why Chinese authorities are willing to provide incinerator builders and operators enormous economic incentives, including low interest loans, tax reductions, and subsidies for generated electricity. The heat of waste-to-energy incineration, however, might be cooled by rising concerns about its environmental and health hazards. Chinese municipal solid waste, composed of a high percent of food residue, is often too moist to be combusted steadily and completely, and has a hard time reaching the minimum temperature of 850 degrees Celsius necessary to eliminate dioxins—a toxic pollutant that damages the immune system, interferes with hormones, and causes cancer. The health issues linked to burning unsorted garbage could cost Beijing $4.1 billion in medical insurance claims by 2020. In the southern metropolis of Shenzhen, dozens of local residents launched a legal battle against the construction of the world’s largest waste-to-energy incinerator in March 2017, fearing the ash and airborne pollutants would contaminate a drinking water reservoir in the vicinity. Nearly 100 public protests against planned incinerators have taken place in the past few years, some of which have successfully halted projects. Chinese officials believe that NIMBY (Not In My Back Yard) syndrome is to blame. Yet relocating the plants does not ease public skepticism rooted in longstanding mistrust of government regulations of the industry, which have neither adequate oversight nor sustainable and profitable business models, resulting in a lack of confidence in government promises to burn garbage in a clean way. City-run incineration plants are required to prioritize energy efficiency and environmental protection in their design and operation, but they are subject to much less stringent emissions standards than those in the power sector. The majority of incinerators, often built and operated by private companies, are even less likely to conform to environmental regulations, often only turning on their air pollutant and wastewater control systems during inspections because it is too costly to run them around the clock when garbage is burned for as little as $3 per ton. A lack of transparency further fuels the government’s credibility crisis; an investigation by a group of environmental NGOs revealed that among all the existing plants, only 77 disclosed their emissions data and 26 failed to meet national emission standards. There is no quick fix for China’s urban waste issues. Instead, municipal governments should recognize the complexity of waste management and disposal and employ a variety of methods such as recycling, composting, anaerobic digestion, and gasification. Over-reliance on incineration will only create mammoth plants that feed on soaring quantities of trash to remain economical, pushing less competitive (and likely more sustainable) technologies out of the market. When the European Union started prioritizing reduction, reuse, and recycling over waste-to-energy technology, cities like Copenhagen could barely maintain these large incineration plants, let alone turn a profit. Chinese cities will soon face similar repercussions if they go all-in on waste incineration. Siyi Mi was a researcher with the China Environment Forum at the Wilson Center. Sources: Bloomberg, Caixin, China Dialogue, China Zero Waste Alliance, CNBC, Greenpeace, Intergovernmental Panel on Climate Change, National Public Radio, National Bureau of Statistics of China, Nature, Quartz, Radio Free Asia, Reuters, Renewable & Sustainable Energy Reviews, Rock Environment and Energy Institute, Shanghai Environmental Sanitation Engineering Design Institute, Sixth Tone, Slate, South China Morning Post, The Economist, The Japan Times, The World Bank, United States Environmental Protection Agency, World Health Organization, Yale Environment 360, Zero Waste Europe. Photo Credits: Sorting Packages for China’s 2017 Singles’ Day courtesy of Ecns.cn.